Centerfire Systems imported some which are now starting to find their way into people's hands. There seems to be little info on the web about 941s specifically like these, such as when these particular variants would have been produced. Any info would be appreciated and I'd like to hear from others who pick these up. Mine: IMI 941F, Israeli police "star" marked, frame mounted safety, polygonal barrel, trigger that makes it single action only, and lanyard ring. Bottom of the mag has reflective tape too because I guess that was a way of identifying a "friendly." Hiya and thx for the thread Mattwood440,and welcome to the forum.Ya might have proper luck searching with the forums search function,or reading the old posts in the cz clone section of the forum. Best best is to just google ,Israel weapon industries LTD and call their number to talk to a rep,or email the thread to them at there website. But did wonder if your came with two barrels and if so what the cal. were for them? And not clear on the rational with the reflective tape and its location. Would not an officers cap make a more practical place, if point is to identify a friendly quickly. And I'd hope the unfriendly's were not crafty enough to employ counter friendly reflective tape,thus disguising their actual friendlyness. Be well. Welcome to the Forum, Mattwood440! Your old Police Jericho was probably made in the late 1980's/Early 1990's time frame, but as the 941's have been in continuous production since the late 1980's, it's really hard to say. I got mine yesterday, a FS nickeled SAO one, in nice shape, except for the grips, which are starting to disintegrate on the left side, and the right is just sticky and looks bad. There is some sort of tape residue on the front of the grip frame, I'm guessing some sort of grip tape was put on and yanked off before it got tossed into the box.I saw zero pits anywhere externally. I haven't taken it apart yet for a good cleaning, but it is really nasty inside. I ordered grips, a recoil spring, A slide stop (I needed a spare one just in case, and it fits like 6 of my guns) , and some grip screws, as the originals are slightly worn and the slots have rust in them. I really wanted a nickel DA/SA Jericho FS to go along with my "Semi Compact" oxide finished one, but the DA ones were gone when I went to the Centerfire site to order. Oh well. The slide to frame fit is almost as good as my Tanfoglio "Mossad" full sized gun I bought from CDI about 10 years ago. 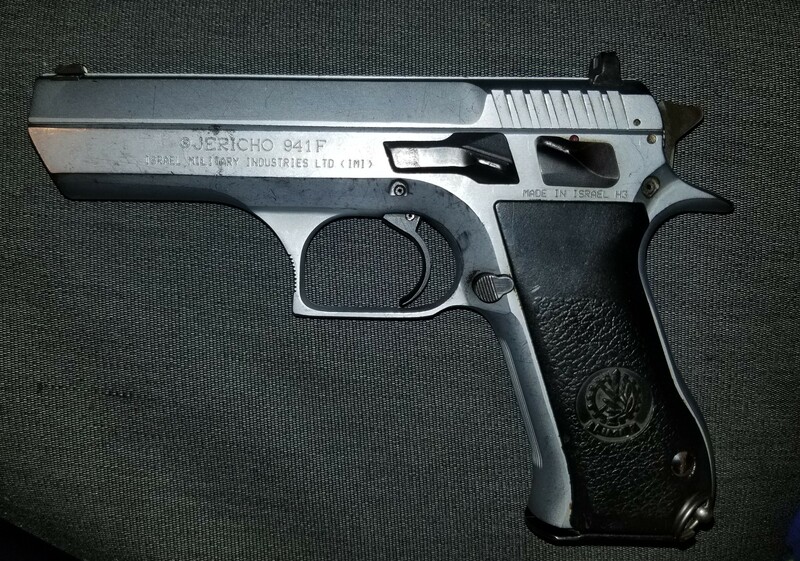 Hemiram, et all, I have the same Chrome Jericho 941F as well as the FS from Centerfire. Love them both! Very accurate and a pleasure to shoot. Also, I am curious where you purchased the spare/replacement parts you mentioned?